BeenThere-DoneThat: More around Tower Hill (2), London. 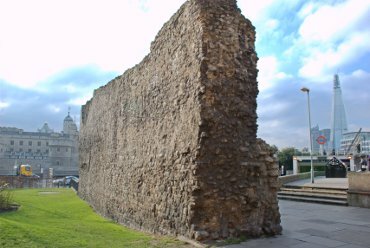 Just outside Tower Hill Station on the left of the steps down to the pedestrian underpass is this section of the old Roman wall around Londinium built around 200 AD. That makes it approximately 1800 years old. You can see Tower Hill Station to the right and part of the Tower of London to the left. 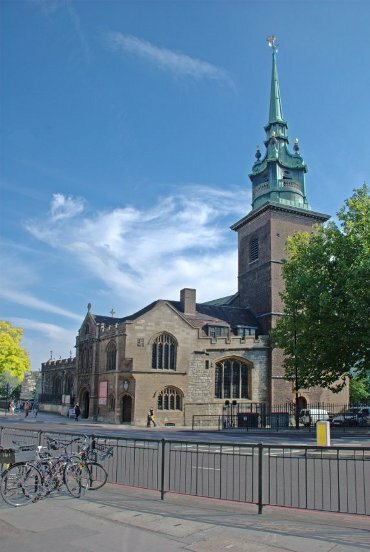 The Church of All Hallows by the Tower is the oldest church in the City of London having been founded in 675. The majority of the church is now more recent but some parts of the Saxon building remain. William Penn, founder of Pennsylvania, was baptised in the church and educated in the schoolroom and John Quincy Adams, sixth president of the U.S.A., was married in All Hallows in 1797. The old Billingsgate Fish Market alongside the Thames Path. 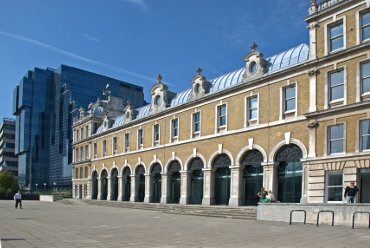 Records show that Billingsgate Market was a general market for corn, coal, iron, wine, salt, pottery, fish and miscellaneous goods until the 16th century, when neighbouring streets became a specialist fish market. By the 16th century, most merchant vessels had become too large to pass London Bridge so Billingsgate, with its deeply recessed harbour, replaced Queenhithe as the most important landing-place in the City. Fruiterers Passage passes under Southwark Bridge and is named after the Worshipful Company of Fruiterers who had a warehouse on the bank above. 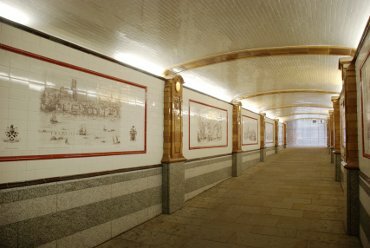 The tiled murals on the walls are taken from old London engravings the originals of are held in the library in the Guildhall. 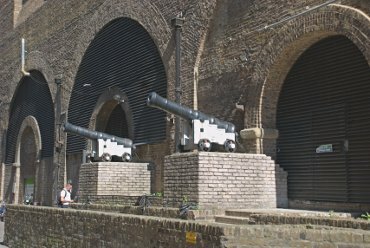 Two cannon by the wall of Cannon Street Station. Nearby is Steelyard Passage which takes the Thames Path underneath Cannon Street Station. Read our report of this trip to London on the Blog.